Smoked beef ribs are some of the best eating around, but you have to be patient if you want them to be tender. You'll be waiting six to eight hours for these to become melt-in-your-mouth tender. Maybe that's why beef ribs aren't appreciated like they should be…lack of patience. These will need some preparation before they are ready to put on the smoker. 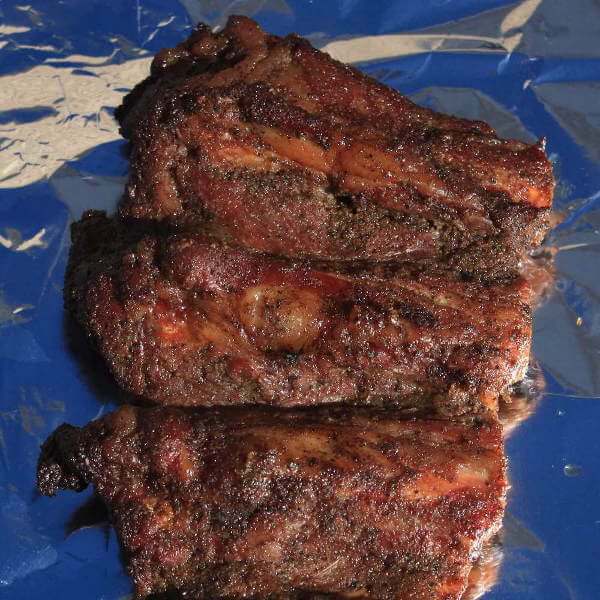 Take a look at the page beef back ribs for more detailed help on smoking ribs. After the ribs have been prepped, it's time to season 'em up. 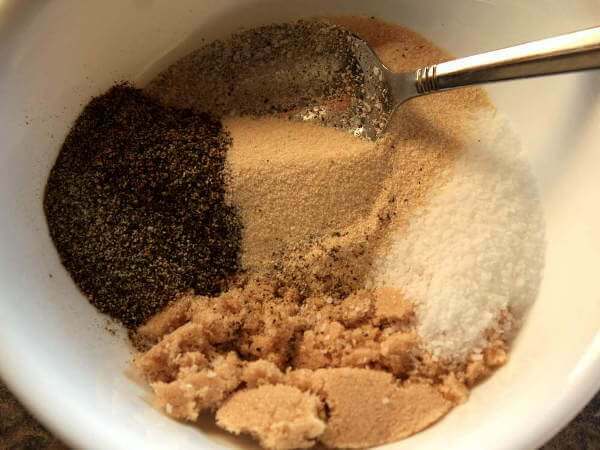 I like to use an good, aromatic dry rub, something with lots of taste. Beef ribs have a lot of flavor, so they can handle full-flavored seasoning. Here's a rub that I use often. Combine all of the ingredients well. This will make about one cup of rub, which should be plenty for two racks of beef ribs. Apply a light coat to the ribs and rub it in. Now, sprinkle on another coat, shaking off what doesn't stick. A light coating is all you need. You could put these on the smoker now, but it’s better to let them rest overnight in the fridge, so the flavors can get into the meat. 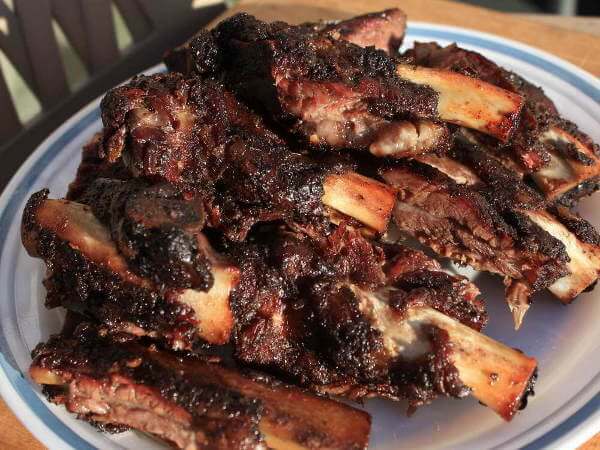 Smoked beef ribs will need six to eight hours of low temperature cooking to reach their ultimate state of perfection. Shoot for a smoker temperature of 225 degrees for the entire smoke session. Oak or pecan is perfect for smoking these big boys. Four hours into the smoke, take a look. Flip the ribs over, and check the water level in the pan if you're using a water smoker. In two hours, look again and test for doneness. Grab a side-by-side pair of ribs and pull them away from each other. If the meat tears easily, they're done. If you like, you can baste the smoked beef ribs with a thinned down bbq sauce during the last half hour of smoking. A mix of half sauce and half apple juice or beer is fine. Just don't let the baste burn. Sugar burns easily, and it would spoil the taste you've been working so hard to achieve. Your Smoked Beef Ribs are Done. Now What? 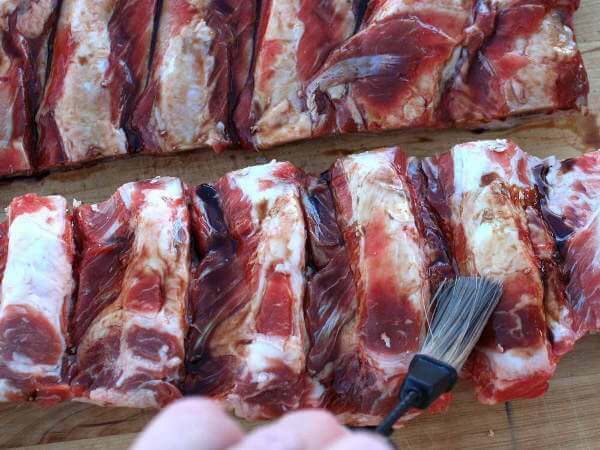 Now that they're done, separate the slab into individual ribs, and serve 'em with your favorite sauce. It's time for the real fun to begin! These big, beefy meat lollipops will surely tickle your fancy!